The Austin 48 Hour Film Project is an annual movie-making contest that requires its participants to make a short over the course of a single weekend. The Austin 48 Hour Film Project kicks off 6 p.m. June 12 and runs through 7 p.m. June 13. Premiere screenings will be held 7 p.m. and 9 p.m. June 22 and 23 at the Alamo South Lamar followed by a Best of Screening at 5 p.m. July 12 at the Alamo South Lamar. 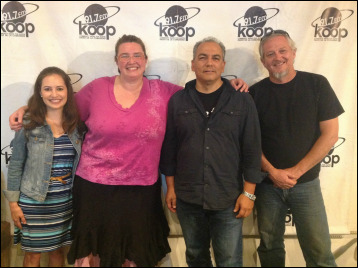 Participating filmmakers Claire O’Neal (left), David Avila (second from right), and Glenn Tait (right) join contest producer Alyne Harding (second from left) during this interview.